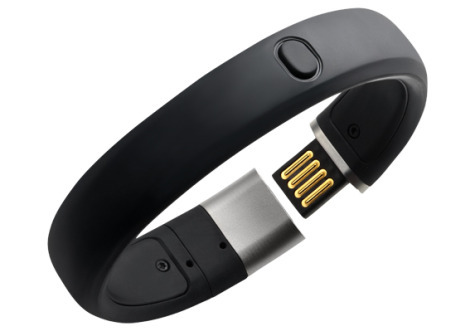 Jawbone's Up may have been a big disappointment due to a big recall program last year, but there's no denying the vast amount of popularity the Up band has been able to gain not long after it has been released. Nike seems to like the idea and has just announced its own fitness band called the Nike+ FuelBand. A wrist band sports a water-resistant rubber exterior with a metal clasp. The Nike+ FuelBand is a more featured fitness wrist band that can track your movement and display your activity like how many calories and steps you've burned and walked using accelerometry. It features an attractive white LED dot matrix display made up from 100 LEDs capable of displaying time amongst your activity data and right beneath it is a row of 20 colorful LEDs that go from red-to-green as the user gets closer to their set goal. 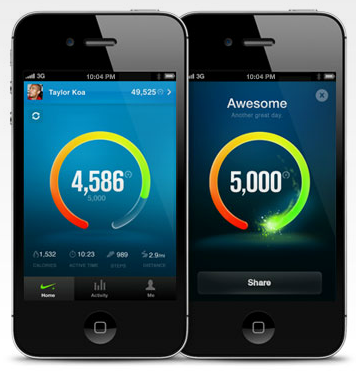 All of the data captured on your Nike+ FuelBand syncs with the Nike+ website using the built-in USB plug much like the Up band, or wirelessly through Bluetooth to the free FuelBand iPhone app to record activity each day and track progress. Once again we don't see any support for Android devices. You can pre-order the Nike+ FuelBand starting today for $149, and start wearing it on February 22. Head over to Nike for all the nitty gritty and jump past the break for the video!